You’d be forgiven for wanting to put your plain black headbands away and not wearing them with youthful dos like braids or ponytails. After all, that was the school-girl attire for many of us and we prefer more grown-up looks now. But Ashley Tisdale shows that you can wear a plain black headband with a ponytail and still look mighty chic! Check her out as she attended a movie premiere in Los Angeles recently. This fashionista wore her locks in a very regular ponytail, accessorizing it with a black headband. Nothing fancy, all just plain Jane, but oh-so-red-carpet-worthy! You too can achieve a similar look with nothing more than a simple headband and an elastic headband. Work on shampooed and conditioned hair, preferably a leave-in conditioner that imparts shine. Use a brush to sweep back all the locks from your head into a ponytail that sits about halfway between the crown and the nape of the neck. Make sure that you do not make a parting. 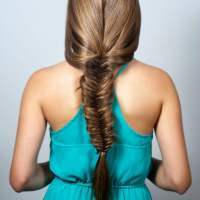 Also ensure that you do not make your hair too flat as this will indeed give you an oily, school-girl look which you may want to steer clear of if you’re going for an elegant look. Tie off ponytail with an elastic band. Slip on the black headband. 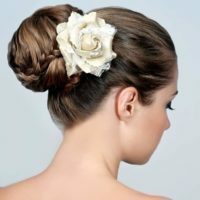 Give your ponytail a bit of a scrunch with your hands so that they gain some volume.